• Garmin Online services - traffic, weather, fuel prices, hotel discounts, etc. Garmin is promising to deliver it in the 3rd quarter, and says that while the PND market isn't dying, the cellphone is clearly a ripe opportunity. Only one problem, as quipster and NPD analyst Ross Rubin pointed out: "Hello and Welcome to nuvifone!" Damn, now I'll never get that voice out of my head. Have a look at all those pictures and the official press release below. New York/January 30, 2008/PR Newswire — Garmin International Inc., a unit of Garmin Ltd. (Nasdaq: GRMN) and the world's leading GPS manufacturer, today announced its entrance into the mobile phone market with the n vifone, an all-in-one, sleek and slim, touchscreen device that combines a premium phone, mobile web-browser, and cutting-edge personal navigator. The n vifone is a work of art in features, design and functionality and is destined to transform how individuals connect, communicate and navigate their life. "The n vifone is an all-in-one device offering unmatched integration of utility and function in a single mobile device," said Cliff Pemble, Garmin's president and COO. "This is the breakthrough product that cell phone and GPS users around the world have been longing for — a single device that does it all." The n vifone is an innovative mobile phone that has a wide range of advanced yet easy-to-use features. The all touchscreen device is the first of its kind to integrate premium 3.5G mobile phone capability with an internet browser, data connectivity, personal messaging, and personal navigation functions in one device. When powered on, the 3.5-inch touchscreen display reveals three primary icons — "Call," "Search," and "View Map" which allow the user to effortlessly master the n vifone's functions. The n vifone is the ultimate multi-tasker. Calls are easily initiated by tapping the "Call" button and selecting a name from the contact list or by using the on-screen keypad. When the user is trying to juggle talking on their phone while entering their vehicle to start a trip, the n vifone makes the transition simple. When the n vifone is docked onto the vehicle mount, it automatically turns on the GPS, activates the navigation menu, and enables hands-free calling so that the user never misses a beat in the conversation and is able to begin routing to their destination with ease. Customers familiar with Garmin's industry leading n vi product line will feel right at home using the n vifone's personal navigation features. It includes preloaded maps of North America, Eastern and Western Europe, or both, and allows drivers to quickly find a specific street address, establishment's name or search for a destination by category using the n vifone's built-in database with millions of points of interest. Turn-by-turn, voice-prompted directions guide the user to their destination. If they miss a turn along the route, n vifone automatically recalculates a route and gets them back on track, speaking the names of the streets along the way. The n vifone is Garmin's first device to include Google local search capability, which harnesses the vast point of interest information available from the world wide web. N vifone users can search for locations like "coffee shops" and Google will sort the results based on the user's current location and relevance. Information provided by Google includes a web-based rating so that users can select the most appropriate destination and route directly to it. In addition, the n vifone includes a web browser incorporating premium features and touchscreen operation for an optimum mobile browsing experience. 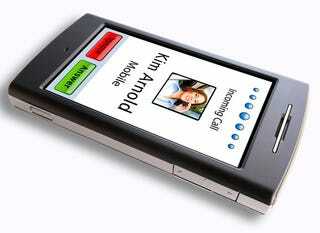 The n vifone also includes personal messaging functions, including email, text, and instant messaging. For the ultimate in safety, the "Where am I?" feature lets users touch the screen at any time to display the exact latitude and longitude coordinates, the nearest address and intersection, and the closest hospitals, police stations and gas stations. The n vifone also helps drivers find their car in an unfamiliar spot or crowded parking lot by automatically marking the position in which it was last removed from the vehicle mount. In addition to navigation, the n vifone includes access to Garmin Online , an online service offering constantly-updating information such as real-time traffic, fuel prices, stock prices, sport scores, news reports, local events and weather forecasts. The n vifone also includes numerous mobile entertainment applications. The built-in camera allows individuals to take a picture that will automatically be tagged with the exact latitude and longitude reference of where the image was taken. The user may then save the image so they can navigate back to the location, or email the image to a recipient who can navigate directly to the location. The n vifone also provides direct access to millions of geo-located landmark and sightseeing photographs available through Google's Panoramio picture sharing site. The Panoramio photo search feature enhances the enjoyment and adventure of sightseeing in an otherwise unfamiliar location. Other multimedia functions of the n vifone include a built-in video camera, MP3 and MPEG4/AAC. Garmin anticipates that the n vifone will be available in the third quarter of 2008. Specific details about pricing and sales partners will be announced in the future. Additional information about n vifone is available at www.garmin.com/nuvifone.